One of the greatest lessons of my life was to recognize the absolute priority of God and His law and His Word, which is what Calvinism is about. I never doubted the Bible, but, as a child, the Lord was there like my parents for me to love and obey and for them to help me. One of the dominant teachings of the New Testament is the universalization of God's plan of redemption. As a result of Jesus Christ's great work of redemption, God expanded His covenant purposes from the Jewish nation to include all the peoples of the earth. This is just what the Old Testament predicted. 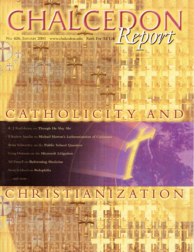 Modern Reformation's September/October 2000 article by Michael Horton, "Defining the Two Kingdoms: One of Luther's and Calvin's Great Discoveries," both signals the dramatic inroads of retreatist Lutheran amillennialism into the Reformed camp and publicizes the increasing neo-Calvinistic abandonment of Biblical law. After the Gulf Wat, the Kurds of Northern Iraq were offered protection from Saddam Hussein by the American government. Saddam, a Muslim, murdered hundreds of thousands of Kurds and gassed their villages while the Islamic world stood by and watched. America, which is perceived as a Christian nation, stopped the genocide. By Val Finnell, M. D.
There are some important applications of Deuteronomy 6:7ff. that need to be considered. The first application regards the question of public or state schools. By Kevin L. Clauson, M.A., J.D. Christ College is a relatively new and unique institution in Christian higher education. Founded in 1990, the college emphasizes a Biblical worldview within a framework of the historic Protestant Reformation. The first annual West-Coast Christian Worldview Conference (WCWC) went off with a bang. It was definitely a harbinger of bigger and better events to come. Rev. P. Andrew Sandlin and Rev. Monte Wilson, III delivered awesome and inspirational speeches to a group of committed young people. Following Van Til, we have sought repeatedly to make this point: he who defines wins. The fundamental question (emphasis on the, the definite article) is this: Who has the original and ultimate right to define?